In performance, Bruce and Marla will take you on a journey. Their love of traditional music will shine through their instruments, and they will wrap you in their beautifully crafted songs, bringing an unusual array of poetry to life with their music and their voices. Marla Fibish and Bruce Victor are Noctambule. They play traditional and original music in a variety of forms – traditional Irish tunes and songs, their own tunes written in traditional forms, and compelling musical settings of a broad array of poetry. This unique collaboration brings out qualities in both of these seasoned musicians that you may not have heard from them before. 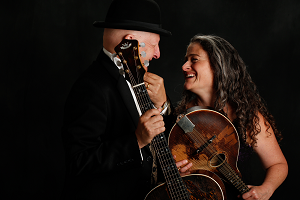 Their music is rendered with lush beauty, sensitivity and humor on an unusual array of strings — various guitars in varied tunings, mandola, mandolin, cittern, tenor guitar — and their blended voices. Bruce Victor is an eclectic and accomplished guitarist and composer, who plays several different guitars in several different tunings. Seemingly resisting any single musical genre, he has been labeled a ‘poly-stylist’ by one of the editors of Acoustic Guitar magazine. He has played with The Sirens of San Francisco, The Triplicates, and as a solo performer. He was the founder of The Acoustic Vortex, a non-profit musical organization that produced house concerts, mentored youth performers, and performed benefit concerts for other non-profit organizations. He is also a practicing psychiatrist and was a Clinical Professor of Psychiatry in the School of Medicine at the University of California, San Francisco.